I´m a Canadian/American living and teaching ESL in a remote mountain region of Costa Rica. I have 17 students between the ages from 6 and 12 and help some highschool students. I´m an unpaid teacher but I get much more out of it than money! When do we use the verb "To Be"? 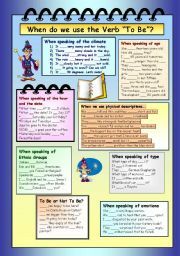 This worksheet reviews the irregular verb "to be". It helps the student to identify the circumstances when "to be" is used such as ethnicity, climate, hour, date, emotions, physical descriptions and type. Thank you PhilipR for the template. 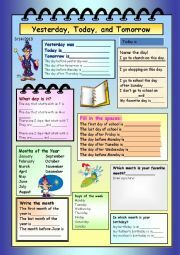 This is a very simple worksheet to teach the days of the week and months of the year.It also teaches the concept of before and after.Draw a picture: Examples might include Christmas,a birthday party, a visit to the beach on summer vacation. 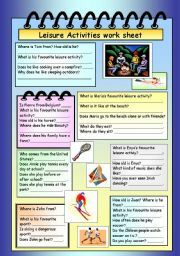 This is the worksheet that goes with the Leisure Activities story page, uploaded seperately. I hope you find it useful. 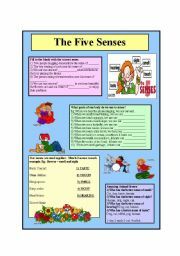 This worksheet discusses the five senses and how to use the words in sentences. 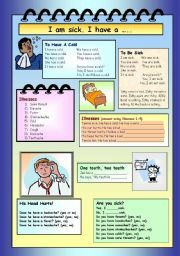 It also asks the ss to identify the body parts used in conjunction with the senses. For a bit of fun, it has a little quiz about "Amazing Animal Senses" with the answers listed at the bottom. I hope it is benefitial to your students. 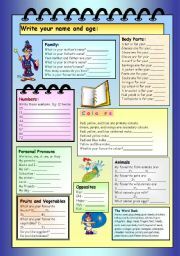 present perfect with the idiomatic use of "for and since"
An answer sheet is provided for this worksheet. 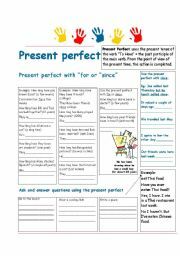 The answer sheet also discusses the uses of the Present Perfect for teaching purposes. 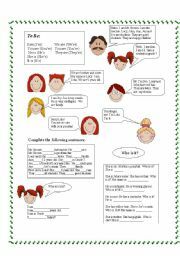 The worksheet gives an example for each exercise and a brief explanation of how the present perfect is formed. I hope you find it useful. This is a beginner´s exercise for the irregular verb "to be". 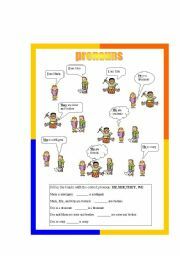 pronouns with the verb "to be"
This is a simple worksheet to identify the pronouns I, He, She, We, and They. It also makes use of the verb "to be". A second worksheet follows and identifies It, and You.